Whether you’ve made it your mission to eat healthier this year, have decided to cut our dairy for health or skin reasons or are simply stuck in a bit of a breakfast rut, this creamy delight is one we’ve been whipping up a few times a week since we got our hands on Eat. Nourish. Glow. by Amelia Freer (HarperCollins, £16.99) and one we promise will be thoroughly enjoyed by even the pickiest of eaters. To share the recipe and tell you more about it, over to Amelia…..
Almonds and apricots used to be my favourite snack as they go so well together, so I thought why not blend them and see what happens? The result is a yummy, zingy, creamy combination that feels like a naughty dessert. I have also added a little rose water, which works perfectly as a delicious breakfast alternative to a sugary yogurt. Soak the almonds in a bowl of cold water for 30 minutes, or overnight. In another bowl, soak the apricots, cardamom and rose water for 30 minutes, or overnight. When ready to serve, drain all the soaked ingredients, put into a blender, add the coconut oil and milk and blend until it is a creamy texture. 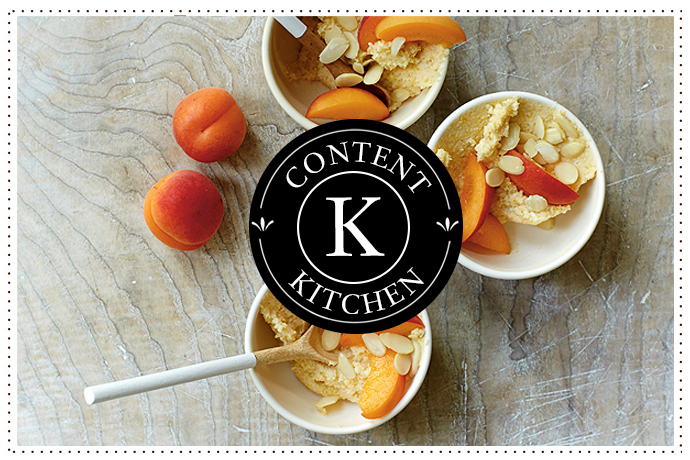 Divide the mixture evenly between 2 jars or glasses, then top with the fresh apricots and a sprinkling of flaked almonds. Put in the fridge and serve chilled.